A brilliant, powerful, historical saga - a grand epic by a prize-winning children's author. The world of 14th-century America is unknown to most readers and Penina Spinka's remarkable novel brings it triumphantly alive, from the tribal wars through to the Norse invasions and the fiercely resisted Christianity. The girl known as Picture Maker because of her great ability at drawing and prophecy, is the daughter of one of the warriors and the granddaughter of the clan leader. She is captured by one of her family's enemies and because she was regarded as a trophy is kept alive and enslaved. When she discovers she is pregnant by one of her captors, she manages to escape, and, inspired by the destiny she had depicted, begins the long, mysterious journey which ends in the furthermost parts of the Western Hemisphere. There, still an outsider but revered and protected, she lives for a time in peace with an Inuit tribe until she meets and falls in love with Halvard, a Norse hunter, who seems to hold the key to the riddle of her birth. Together they travel on to Greenland but Picture Maker's special gifts make her regarded with suspicion, Halvard is attacked and her daughter will be taken from her, in what seems a terrible repetition of what happened to her so long ago. Picture Maker is a powerful story, with a large cast of vivid characters, in a fascinating setting which will appeal to readers of Jean Auel and Jane Smiley. Penina Spinka, an award-winner for her children's books, has created a rich picture of the period and the people, of the ways of the societies and religions, and above all of Picture Maker herself, as she grows beyond her once narrow, ordered confines: an amazing and very human survivor. 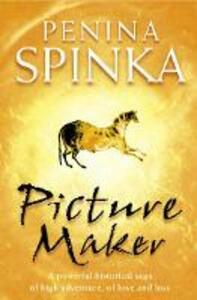 At its heart, Picture Maker is a novel of high adventure, of love and loss, and survival under the harshest circumstances.